[S11] Alison Weir, Britain's Royal Families: The Complete Genealogy (London, U.K.: The Bodley Head, 1999), page 76. Hereinafter cited as Britain's Royal Families. [S6] G.E. Cokayne; with Vicary Gibbs, H.A. Doubleday, Geoffrey H. White, Duncan Warrand and Lord Howard de Walden, editors, The Complete Peerage of England, Scotland, Ireland, Great Britain and the United Kingdom, Extant, Extinct or Dormant, new ed., 13 volumes in 14 (1910-1959; reprint in 6 volumes, Gloucester, U.K.: Alan Sutton Publishing, 2000), volume XII/2, page 178. Hereinafter cited as The Complete Peerage. [S6] Cokayne, and others, The Complete Peerage, volume II, page 421. [S6] G.E. Cokayne; with Vicary Gibbs, H.A. Doubleday, Geoffrey H. White, Duncan Warrand and Lord Howard de Walden, editors, The Complete Peerage of England, Scotland, Ireland, Great Britain and the United Kingdom, Extant, Extinct or Dormant, new ed., 13 volumes in 14 (1910-1959; reprint in 6 volumes, Gloucester, U.K.: Alan Sutton Publishing, 2000), volume III, page 258. Hereinafter cited as The Complete Peerage. [S38] John Morby, Dynasties of the World: a chronological and genealogical handbook (Oxford, Oxfordshire, U.K.: Oxford University Press, 1989), page 106. Hereinafter cited as Dynasties of the World. [S3434] Alexis Arévalo Vergara, "re: Arévalo Vergara Family," e-mail message to Darryl Roger Lundy, 11 December 2008. Hereinafter cited as "re: Arévalo Vergara Family." [S6] G.E. Cokayne; with Vicary Gibbs, H.A. Doubleday, Geoffrey H. White, Duncan Warrand and Lord Howard de Walden, editors, The Complete Peerage of England, Scotland, Ireland, Great Britain and the United Kingdom, Extant, Extinct or Dormant, new ed., 13 volumes in 14 (1910-1959; reprint in 6 volumes, Gloucester, U.K.: Alan Sutton Publishing, 2000), volume XII/2, page 547. Hereinafter cited as The Complete Peerage. [S53] Unknown editor, editor, Cambridge History of English and American Literature (Cambridge, U.K.: Cambridge University Press, 1907-1921), volume II. Hereinafter cited as Cambridge History of Literature. [S11] Alison Weir, Britain's Royal Families: The Complete Genealogy (London, U.K.: The Bodley Head, 1999), page 101. Hereinafter cited as Britain's Royal Families. 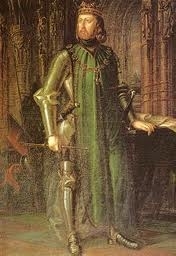 Enrique III, Rey de Castilla y León was born on 4 October 1379. He was the son of Juan I, Rey de Castilla y León and Eleanor de Aragón.1,3 He married Katherine of Lancaster, daughter of John of Gaunt, Duke of Lancaster and Constanza de Castilla, Reina de Castilla, in September 1388 at Church of St. Antolin, Fuentarrabia, Castile, SpainG.4 He was also reported to have been married circa 1393. He died on 25 December 1406 at age 27 at Toledo, SpainG. [S4893] Anonymous, "re: Castañeda Family between La Palma and Cuba," e-mail message to Darryl Roger LUNDY (101053), 12 September 2010. Hereinafter cited as "re: Castañeda Family." Juan I, Rey de Castilla y León was born on 24 August 1358. 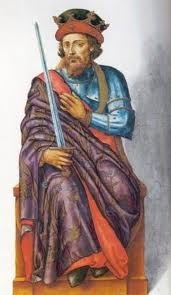 He was the son of Enrique II, Rey de Castilla y León and Joanna de Peñafiel.1,3 He married, firstly, Eleanor de Aragón, daughter of Pedro IV, Rey de Aragón and Eleanor of Sicily, in 1375.4 He married, secondly, Beatriz de Bourgogne, Princeza de Portugal, daughter of Fernando I de Bourgogne, Rei de Portugal and Eleonore Telles de Meneses, in 1383.5,3 He died on 9 October 1390 at age 32. [S6] G.E. Cokayne; with Vicary Gibbs, H.A. Doubleday, Geoffrey H. White, Duncan Warrand and Lord Howard de Walden, editors, The Complete Peerage of England, Scotland, Ireland, Great Britain and the United Kingdom, Extant, Extinct or Dormant, new ed., 13 volumes in 14 (1910-1959; reprint in 6 volumes, Gloucester, U.K.: Alan Sutton Publishing, 2000), volume XII/2, page 904. Hereinafter cited as The Complete Peerage. [S38] John Morby, Dynasties of the World, page 113.